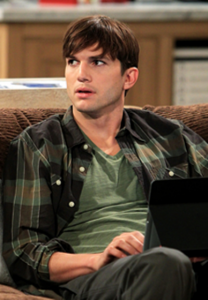 Ashton Kutcher knocks former Two and A Half Men star Charlie Sheen off the top 10 list and takes over the No. 1 spot on the Forbes list of the Highest Paid TV Actors. In a time span from May 2011 and May 2012, Kutcher earned $24 million. In addition to acting, he is an active Silicon Valley investor and got in early on Skype, Spotify and Airbnb which is now worth $1 billion. Ranking second on the list behind Kutcher are Hugh Laurie and Ray Romano, who both earned $18 million. Alec Baldwin and Mark Harmon tie for fourth place with $15 million each. Don’t count out Sheen… He may be ‘winning’ in the future thanks to a great deal on the show Anger Management.